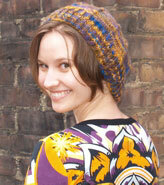 You wouldn’t have been able to let this skein languish in your stash, would you? It’s Stricken Smitten’s Smitten BFL Nylon Twist. It struck and smote me, as advertised, at Sock Summit. This base has actually got more nylon (20%) than I think it needs — 10% would have been more than sufficient for a longwool like BFL, in my opinion — and it’s got a rather squeaky hand as a result, but ooooooooooh, that cherry tart red! And that tight twist. This is a bombshell sock yarn just quivering for a chance to strut its stuff. And nothing shows off a yarn like this one better than twisted stitches, Bavarian style. So I cut it out of the herd for a riff on a Cookie A. pattern I’ve been planning. 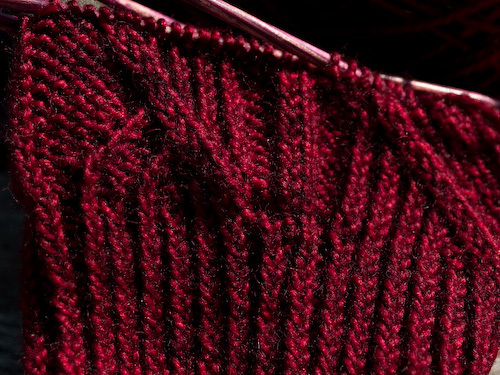 The jumping-off point is Kristi, from her Sock Innovation — I was immediately drawn to the slaloming double and single ribs, but I knew I’d never finish the socks if I attempted the jack-in-the-pulpit motif the ribs frame. That Cookie A. is a genius, but I’m pretty sure she doesn’t stay up all night with sticky overheated babies and then try to knit from complicated charts for a round here and a round there. So I thought I’d keep those swooshy ribs but fill in with regular twisted rib so I’d be able to read my work more easily. We’ll see what happens, but I have high hopes thus far. I actually did feel I needed a small, single-skein project on the needles because it’s really been too hot to swelter under a wool cardigan. Our late summer is just hitting its stride and treating us to a week of temperatures in the 90s (that’s the 30s in the Celsius world, right, Meg? 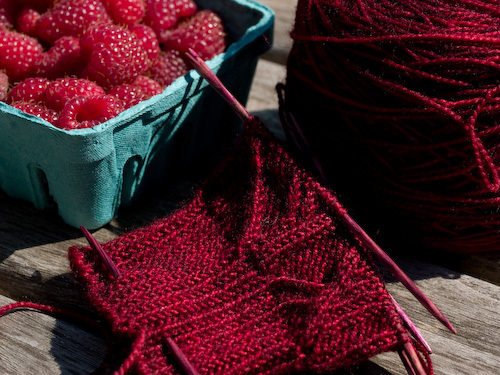 ), so we’re spending all the time we can in the wading pool, swinging on the front porch, and gobbling “hazboo” and “buhboo” (those are raspberries and blueberries to you and me) while the gobbling’s still good. I have a feeling it’ll be some weeks before I’m ready to contemplate putting a woolen sock on my foot, but it doesn’t hurt to think ahead, right?